HOLDEN, Mass. 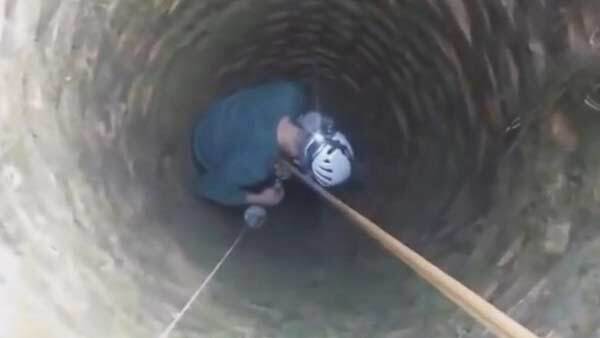 -- After months of living alone in a well, a blind, elderly dog named Christmas has been rescued -- and his rescue was captured in a touching video, ABC News reports. "Surprisingly, the dog is in fairly good, physical condition," said Laura Simpson, founder of the Harmony Fund in Holden, Massachusetts. "The blindness of course is from a pre-existing condition, but he's now in foster care and we're hoping he can find a home there he's loved and respected in the way he should be." Simpson told ABC News that it was last week when international animal rescuer Fahrudin Caki Bravo and his friend Ratko Koblar received word of a dog trapped in a well in nearby Bosnia. "The dog had been there for months and they don't know if he was thrown in, or if he fell in," Simpson said. "We're certainly hoping that he fell, but with the dog being completely blind, he was only kept alive because the local children were kind enough to feed him." "He (Bravo) and his friend thought it was perfectly feasible getting the dog out and they did a great job," she added. "They made it look easy." Bravo and Koblar lifted Christmas the dog from the well, which was 8 meters deep, in just minutes, Simpson said. Following his rescue, which was caught on camera, Christmas received veterinary care and was placed in foster care. "I think there's another video clip he (Bravo) had sent me where he's rubbing Christmas' belly and he was in heaven," Simpson said. "Christmas is a very gentle dog with a very sweet, and forgiving disposition."